Darrin was looking for a inshore Miami fishing guide so he could take his two sons flats fishing. He had tried some offshore fishing charters in the past and was looking to fish for some Big game fish in the shallow protected waters of Biscayne bay. We headed out to first catch some shark bait and his kids were pro’s at it. We went to a spot that holds some barracuda and sharks. Usually I find lemon sharks there, but on this day, not long after putting the bait out, a Giant bull shark shows up in around three feet of crystal clear water. We all watched in awe, as it would swim up to the bait, but just did not take it. After several passes at the bait I said we need a second shark to get the competition going. Not long after I said that; here comes another shark, another bull shark. But this one is not as large as the first one. But still very big! This one comes straight to the bait and ate it with no hesitation and we are on. 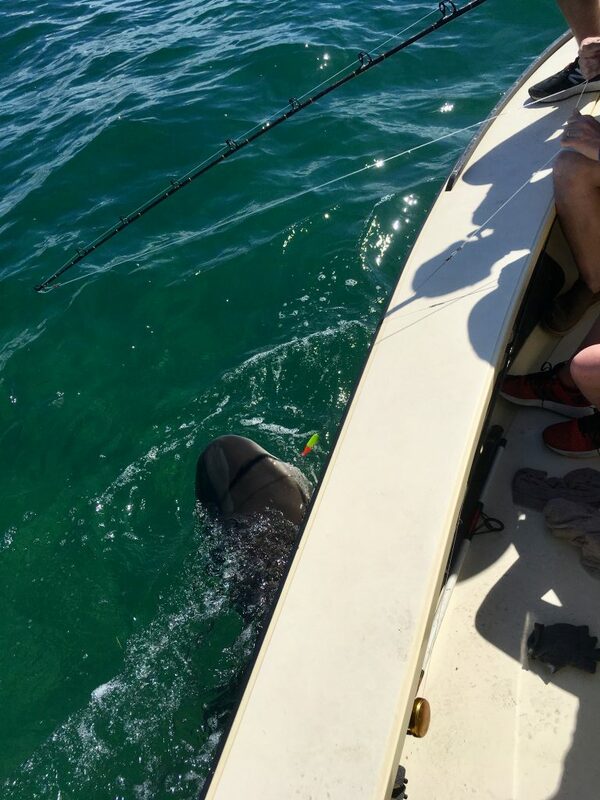 After a hour of long hard fighting of this bull shark, Darrin’s back was hurting and handed the rod off to his son that got to see first hand how strong this shark is. Another 20 minutes we got the big bull shark along side of the boat. I wanted to try to get this big shark to lay up high with the family sitting along side of it to show just how big it is. It just all of a sudden came off the hook I got one quick photo of the shark, but it does do it justice. It was eight and a half feet long and would weigh at least 300 pounds!